Fern house plants require little care, thrive in low light and warm temperatures, and add visual interest to any room of the home. Ferns produce attractive, delicate-to-dramatic foliage in a variety of different textures, colors and lengths. Regardless of type, all ferns share similar care requirements. Ferns typically grow on shady, damp forest floors and perform best when these conditions are re-created indoors. Providing ample moisture and humidity keeps the plants growing strong with little extra attention from you. 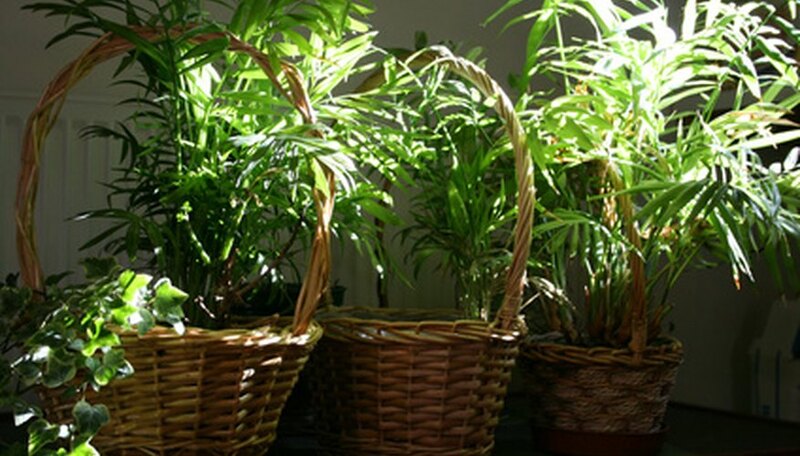 For the best results, buy fern house plants with healthy fronds and avoid those that appear dry. Place fern house plants in a location that receives indirect light throughout the day, such as a north-facing window. Maintain a temperature of 65 to 75 degrees Fahrenheit during the day and 55 to 65 degrees at night. Water ferns once per week during spring, summer and fall to keep the soil consistently moist. Reduce watering frequency to once every 10 days during winter, when the plants are not growing as actively. Soak the soil in the container thoroughly until water begins to seep through the drainage holes, and then pour away any excess moisture. Fill a shallow tray with pebbles, and then add water to the tray until the pebbles are almost completely submerged. Place the fern plant's container on top of the pebbles to increase the relative humidity of the air. Replenish the water as often as necessary. Feed fern house plants once per month from April through September using a liquid houseplant fertilizer. Apply at half the rate recommended by the manufacturer to avoid over-fertilizing, which results in brown, burned foliage. Re-pot ferns once every two to four years, or whenever they have outgrown their current container. Increase the size of the pot by 3-to-4 inches and provide a moist, fresh potting mix to ease the stress on the plant. Do not fertilize for four to six months after re-potting. An east-facing window is ideal for fern house plants during winter. Supplemental misting may be required during winter, when indoor air is drier. Use a spray bottle filled with room temperature water to mist the plant twice per day. Alternatively, a humidifier placed near your ferns will keep the air humid year-round with less effort.